Can I Make an Injury Claim if I am Partially at Fault? If you are partially at fault for an accident, you can still make an injury claim? Sustaining a traumatic brain injury (TBI) can change a person's life—and not for the better. Each year in the United States, approximately 1.4 million people suffer some degree of a TBI. Of those 1.4 million people, roughly 50,000 die from their injury and more than 235,000 are hospitalized, according to the Brain Injury Alliance. TBIs can occur when a violent jolt or blow to the head disrupts the brain's normal functions, resulting in physical, cognitive, and behavioral impairments. In some cases, these impairments may be temporary and can last for hours or months. In other circumstances the TBI can last through the life of the injured victim. However, the International Brain Injury Association (IBIA) estimates that as many as 5.3 million Americans are living with a disability related to a TBI. Car accidents are a leading cause of TBI-related emergency room visits, hospitalizations, and deaths. If you sustained a TBI in a car accident caused by another person or entity's negligence, you may be entitled to compensation for those injuries. Here's what you need to know. TBIs can be grouped into two major types: open and closed. An open TBI is one where a foreign object has penetrated the skull or there is a fracture in the skull. In closed TBI injuries, no penetration is present in the skull or dura mater. TBIs can also be classified by severity. Concussions are the mildest—and most common—type of TBI. In most cases, mild concussions heal with no long-term negative effects. However, if a TBI concussion victim sustains another concussion before the first has healed, the injuries can have a cumulative effect. Moderate to severe TBIs are more serious, and more likely to result in long-term impairments. Moderate TBIs are characterized by abnormal brain imaging, and loss of consciousness or post-traumatic amnesia for up to 24 hours, while severe TBIs are characterized by abnormal brain imaging, loss of consciousness, coma, or post-traumatic amnesia for more than 24 hours. Motor vehicle crashes may be a leading cause of TBIs, but vehicle accidents are far from the only type of personal injury accidents that can result in these types of injuries. According to the Centers for Disease Control and Prevention (CDC), falls are also responsible for TBIs, accounting for a full 47 percent of all TBI-related emergency room visits, hospitalizations, and deaths. In addition to car accidents and falls, TBIs can also occur when a victim is struck by a falling object or struck against a stationary object. 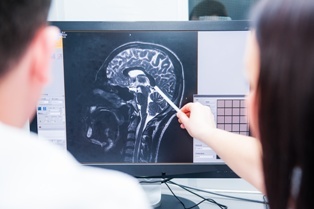 Car accident victims with moderate or severe TBIs may require lifelong medical treatment, rehabilitative therapies, assistive services and home modifications – the costs of which can quickly become insurmountable. Researchers at Northwestern University's Feinberg School of Medicine estimate the lifetime treatment costs for a traumatic brain injury to be somewhere between $85,000 and $3 million, not inclusive of non-medical care. In cases where the defendant's actions were particularly egregious, an additional type of compensation—known as punitive damages—may be available. Do You Need a California Traumatic Brain Injury Car Accident Attorney? If you suffered a TBI in a car accident that wasn't your fault, you're probably well aware that there's a lot riding on the outcome of your personal injury insurance claim or lawsuit. With so much at stake, there's no room for error, which is why it's essential for accident victims to find knowledgeable legal representation they can count on. The skilled legal team with the Inland Empire Law Group is dedicated to helping car accident TBI victims understand their rights and options, and pursue the compensation they need and deserve. Do you have questions about a car accident case? Contact us today at (888) 694-3529 to schedule an appointment for a free initial case analysis.